Measuring success with the drill bit. Prior to official results, the speculation for 2015 was that discovered hydrocarbon volumes would continue their downward trend. The results now in show that the 2015 offshore-discovered volumes were 8.5 Bboe, of which 2.6 Bboe were liquids. This is slightly lower than the results in 2014, and considerably lower than the 18 Bboe discovered in 2010. In terms of activity, about 600 offshore exploration wells were drilled through the year, resulting in total investment of US$55 billion, 25% lower than 2014 values. Global 2015 offshore-discovered volumes for the 15 largest operators (excludes volumes added from successful appraisal exploration), Million boe. Source: Rystad Energy UCube The chart opposite shows the 15 largest operators in terms of discovered offshore volumes in 2015. 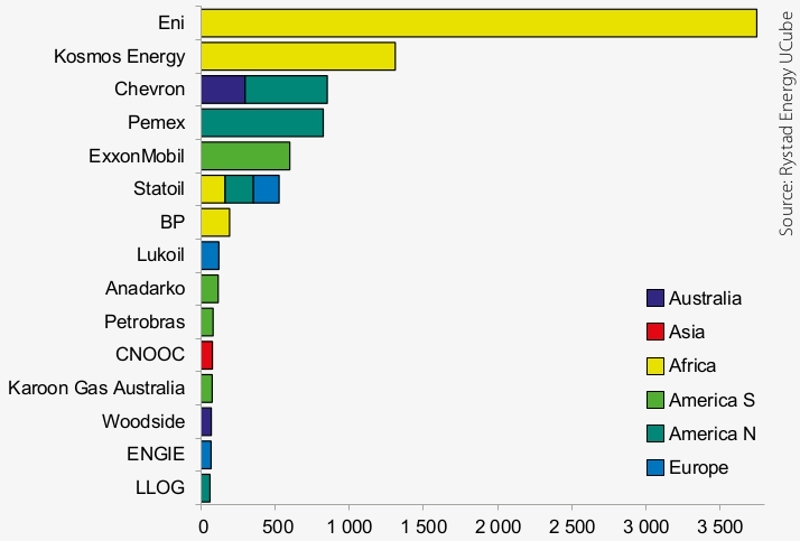 Topping off the list is Eni, with 3.7 Bboe of discovered resources last year. Most of these volumes are related to the Zohr discovery, located in the Egyptian part of the Mediterranean. Kosmos Energy takes second place with its discoveries in Mauritania. These discoveries may contribute to a new gas province on the western side of Africa - similar to what has happened in Mozambique and Tanzania, where the teams of Anadarko/Eni and BG/Statoil are both planning large LNG developments. Another important discovery was Exxon’s Liza discovery in Guyana; the resource estimate of 600 Mboe makes this the largest oil discovery in 2015. In many ways, 2015 is similar to preceding years, with discoveries dominated by large African gas finds. Other regions had more disappointing results. Offshore Europe discovered 500 Mboe, with the Romanian Lira discovery as the main driver. In Asia, around 300 Mboe were discovered, while there were no significant discoveries in the Middle East. If we compare 2015 discovered offshore volumes with 2015 production, it is obvious that we would not be able to replace the volumes we produced during the year. In 2015, total offshore production was 16 Bboe, of which 9.7 Bboe was liquids, considerably lower than the amount discovered. In the long term, this implies that it will become difficult to keep up offshore production volumes. StatoilHydro has grown into a major player in Angola. With more than 200,000 barrels of oil produced every single day, and having assisted Sonangol to become an operator, the time is now right to take the next step. With strong support from the head office back in Norway, StatoilHydro is ready to take on operatorship in Angola.